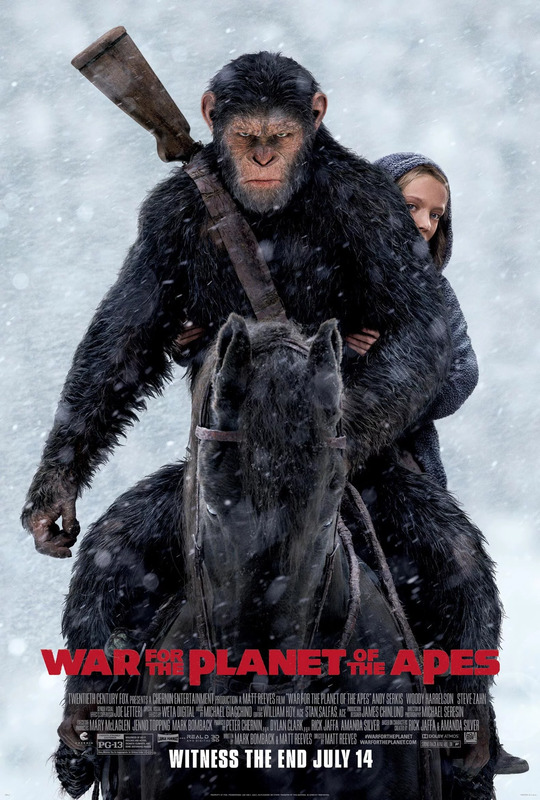 MY HOUSE – I recently caught a showing of “War for the Planet of the Apes.” It is a gorgeous, well-produced, well-scored, and (fairly) well-acted movie that has the greatest CGI I’ve ever seen. The apes are truly a sight to behold. At the same time, the story, while okay, is a little weak. In sum, it’s a good movie. I give it a 7.1/10. NOTE: I just realized that those unacquainted with the storyline of the original 1968 film ought not read further as the review will include spoilers. Actually, if thou art unfamiliar with the 1968 film, I recommend not watching ANY of the prequels until thou hast watched the original. It will be better that way. Trust thou me. Getting back to the review, this movie finishes off the backstory of Cesar, a genetically enhanced chimp who leads his troop of apes to dominate the earth after the human race gets nearly entirely wiped out as a result of a viral pandemic. At this point in the saga, Cesar has basically turned into a human ape. He speaks just as well as any human, and he lives in a thoroughly human-like family structure complete with wife and kids. So, when some of the remaining actual human soldiers try to take down the ape stronghold and end up killing Cesar’s wife and eldest son, Cesar reacts like any movie husband/father would: he embarks on an epic quest to take down the evil Colonel (played by Woody Harrelson) who is responsible for their deaths. Think “Collateral Damage” but with monkeys and no Schwarzeneggers. Of course, things go badly, and, while he’s questing, Cesar’s troop is captured en masse by the Colonel and his men, whereupon he has to figure out how to save everyone in addition to getting revenge for the deaths of his wife and son. Those who know “Planet of the Apes,” know things don’t turn out well for mankind. Overall, I found the plot to be too predictable, but I don’t recommend this movie for the plot. I mean, I guess it is fairly interesting to see the story behind “Planet of the Apes,” but this movie doesn’t even fully bridge the gap. Instead, I recommend this movie entirely for the CGI (this is very surprising as I usually abhor CGI). As mentioned earlier, the apes look fantastic. The skin and fur textures are remarkable, and the up-close facial shots are awe-inducing. Special mention has to be made of Maurice; whoever did the work on Maurice deserves an award. It’s unclear how they were able to make these creatures look so good; I haven’t done any research, but I’m wondering if some of this success is due to practical effects. Regardless, the apes look phenomenal. One more thing deserves mention before closing: this movie was scored by Michael Giacchino. Do what you will with this information. In the end, despite the somewhat weak story, I think this is a good movie that will delight most cinema lovers. Go see it for the CGI if for nothing else. Editor’s note: this was written about a month ago when the movie was still in theaters. Hopefully this review will help in deciding whether it’s worth a rental or not.